Mammoth’s resident sleep expert, Dr Jonathan Bloomfield shares what you can do in the bedroom to achieve a restful and restorative night’s sleep. Life is busy. Between work, travel, family life, housekeeping, activities and all the other things that your days are filled with, it can often seem impossible to achieve a good night’s sleep. But sacrificing sleep or compromising on the time you allocate for rest and recovery is something you do at your peril. Sleep may seem like wasted time because we are not conscious, but it is during this time that we grow muscles, repair tissue and synthesise hormones whilst asleep, and multiple studies have found that sleeping well results in an improved memory. With this in mind, it is incredibly important to make the bedroom environment a haven for rest and sleep. Sleeping in a light or even dimly lit room tricks our brain into thinking it’s time to be awake. This means that turning off all artificial lights and fitting blackout blinds or curtains is crucial in the bedroom. In addition, many people choose to invest in eye masks to completely block out any unwanted rays. For most people, the ideal sleeping temperature is between 16-18°C. Research has shown that this small but important drop in body temperature initiates a number of biological changes in the body and helps us to sleep soundly. Stimulation might be good for keeping the brain active during the day but at night they can prolong the time it takes for an individual to fall asleep and begin cycling through the different phases of sleep. Bright colours, busy textures, accessories and even too many mirrors can reduce the sense of rest and relaxation in a room. Instead, it is advised that the bedroom is a calm and soothing space. 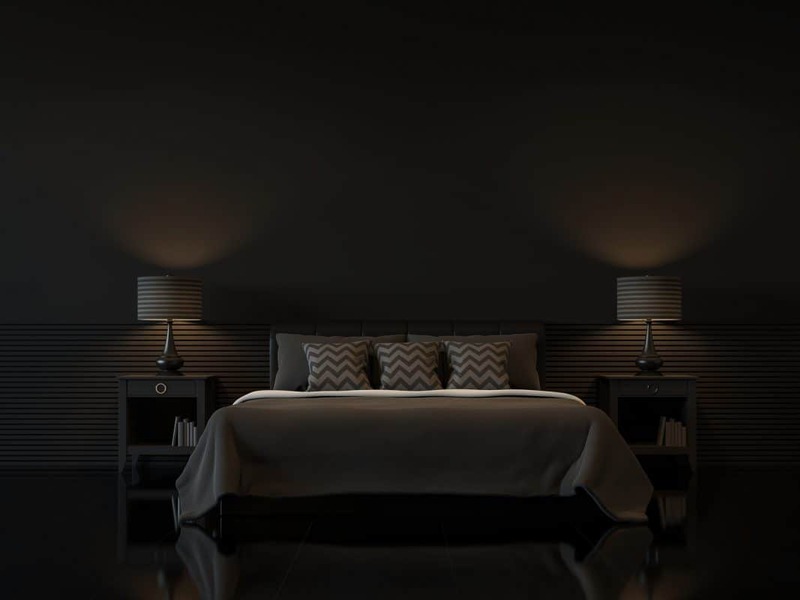 Consider having soft lighting options or else fit a dimmer to your main light so that even as you prepare for bed you are encouraging your body and mind to ease down. Neutral colours on the wall can help and pastel shades to soft furnishings will really help to get you in the mood for sleep. Of course, the most important aspect of the sleep environment is the surface on which you sleep and the habitat within which you curl up. A sleep system (the name given to the base, mattress, pillows, duvet and sheets) is a fundamental requirement here. The sleep system is responsible for supporting your body, relieving pressure, regulating temperature, maintaining neutral alignment and generally creating a sense of comfort that enables you to power down and fall gently asleep.